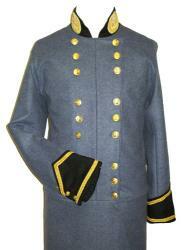 We offer accurate reproductions of uniforms worn by famous Confederates. We can also custom make other uniforms from a picture and specifications provided by you. If the options below don't meet your needs, call us to discuss your specific customization requirements. All Famous Confederate Uniforms are custom made specifically for you and are subject to a restocking fee. Please allow 4-6 weeks for delivery. Worn only once. C&C Sutlery CS General Frock Coat is patterned after Robert E. Lee's coat. This 16-button front coat is made of Cadet Gray wool and has solid staff (buff) trim on the collar and cuff and buff piping on the lapels and front. 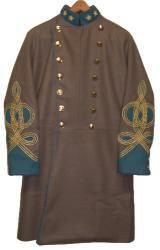 The coat features General's braid of 4 rows on each sleeve and General's collar insignia. There is a 6 button officers pattern on the back of the the coat and pockets in the skirt. The cuff is a 3 button functional cuff. Choose CS Staff or Virginia buttons. The coat is fully lined with black cotton lining and muslin sleeve lining and has one inside pockets. 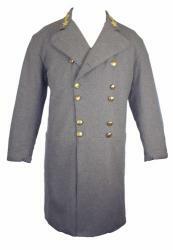 This CS General Frock Coat is patterned after Robert E. Lee's coat. This 16-button front coat is made of Cadet Gray wool and has solid staff (buff) trim on the collar and cuff and buff piping on the lapels and front. 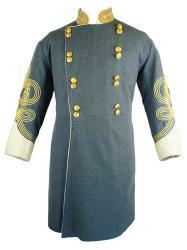 The coat features General's braid of 4 rows on each sleeve and General's collar insignia. There is a 6 button officers pattern on the back of the the coat and pockets in the skirt. The cuff is a 3 button functional cuff. The buttons are CS Staff buttons. The coat is fully lined with black cotton lining and muslin sleeve lining and has one inside pockets. A 24-button front is available for an additional charge. CS Frock Coat - General R. E. Lee 'Back Porch Uniform"
This Frock Coat is patterned after the coat Robert E. Lee was wearing when photographed on his back porch in Richmond Virginia by Matthew Brady April 1865. This uniform is often referred to as the 'Back Porch Uniform". The coat is made of officers grade wool. The plain sleeve without braid makes this a type of field uniform. The lapel is a fold-over civilian style and the collar is adorned with 3 5-pointed stars instead of the typical general's wreath surrounding the stars. The 16-button front of Virginia State seal buttons are placed in the typical General's button pattern of 4 sets of 2. There is a 6 button officers pattern on the back of the the coat and pockets in the skirt. The cuff is a 3 button functional cuff. The coat is fully lined with black cotton lining and has one inside pockets. The coat is available in a variety of wool colors. This CSA Major General Frock Coat is patterned after George E. Pickett's coat. This 18-button front coat is made of Cadet Gray wool and has solid black trim on the collar and cuff and General's collar insignia. Gold braid encircles the sleeve cuff bottom and outlines the cuff point. The cuff is a 3 button functional cuff. There is a 6 button officers pattern on the back of the the coat and pockets in the skirt. The buttons are CS Staff buttons. The coat is fully lined with black cotton lining and muslin sleeve lining and has one inside pockets. The bottom of the coat skirt is raw per the originals. Dark blue trousers with two1/2' stripes of gold braid, 1/4" apart, are appropriate for this frock coat. A navy blue kepi with 4 rows of gold braid complete the uniform for general George E. Pickett. The C&C Sutlery General Pickett Trousers feature two stripes of 1/2 inch metallic gold lace, spaced 1/4 inch apart, down the outside seam of each leg. The button fly is lined with cotton to make it more flexible for buttoning. The adjustable "V" back on the waistband has eyelet holes for a tie to allow for waist adjustment. There is a dart on the back of each side that makes the trousers taper into the waistband. The trousers have a watch pocket and Side Seam pockets. Fly buttons and suspender buttons are pewter. Inseam measurement is not needed as the trousers are unhemmed and can be either rolled up, cut off, or hemmed by the customer. Confederate cavalry leader John Singleton Mosby, nicknamed the "Gray Ghost", is among the most romantic characters in the Civil War. His command,organized in early 1863, the 43rd Battalion, 1st Virginia Cavalry, known as Mosby's Rangers or Mosby's Raiders, was a partisan ranger unit noted for its lightning quick raids and its ability to elude Union Army pursuers and disappear, blending in with local farmers and townsmen. Mosby's Raiders sacked supply depots, attacked railroads, and harassed the Union troops. The area of northern central Virginia in which Mosby operated with impunity was known during the war and ever since as Mosby's Confederacy. This shell jacket is made of gray wool, lined in black lining, and features a buff wool collar and cuff. It has a 14 button front of CS staff buttons and a 3 button functional cuff. There is also a left breast exterior pocket. There are 2 inside pockets. The jacket comes complete with 3 stars on the collar. Complete your uniform with a Mosby-style gray felt slouch hat trimmed in grosgrain ribbon. 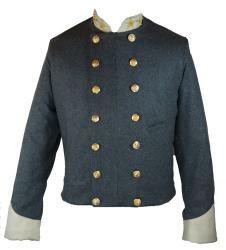 This CS Colonel Frock Coat is the coat of Col. Lawrence Massillon Keitt as described in Commanders of the Civil War by William C. Davis page 68. Keitt commanded the 20th South Carolina Volunteer Infantry Regiment and later Kershaw's Brigade. Mortally wounded at the Battle of Cold Harbor on June 3, 1864, Keitt died the next day near Richmond, Virginia. This coat comes complete with Colonel Braid (three rows) on each sleeve, Colonel collar insignia, 14 button front with CS staff buttons, solid trim or piping on collar and cuff, full length lapel and skirt piping, fully lined with black cotton lining, and 2 inside pockets. There is a 6 button officers pattern on the back of the the coat. The cuff is a 3 button functional cuff. This coat is shown in Tuscaloosa Grey wool with Sky Blue collar and cuff and Sky Blue piping on lapels and skirt.